Home / Timothy Taylor: Conversable Economist / How to Reduce Health Care Costs? How to Reduce Health Care Costs? The US spends about 18% of GDP on health care. Other high-income countries spend an average of about 11%, Thus, the Society of Actuaries and Henry J. Kaiser Family Foundation have created Initiative 18/11 to consider ways of holding down US heath care spending. A first report from the initiative, "What Can We Do About the Cost of Health Care?" (January 2019), doesn't yet offer proposals for action. But it offers a useful sense of what many of the main targets are likely to be of any serious effort to reduce healthy care costs. 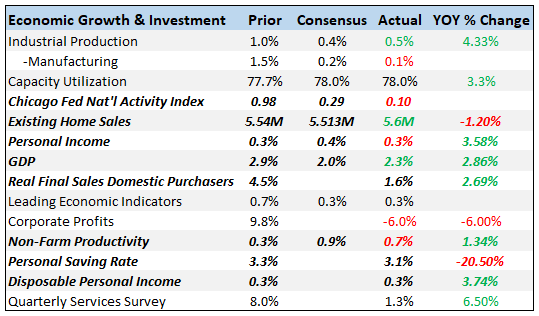 Here are some of my own reactions and takeaways from the report. Although the report doesn't emphasize this point, it's worth noting that 18-11+7, and with a US GDP of about $20 trillion, 7% is $1.4 trillion. If you find yourself wondering why other countries can apparently afford improvements in physical infrastructure or higher support for education or higher social benefits of certain kinds, part of the reason is that a much lower level of their social resources is going to health care spending. If you wonder why your paycheck seems to go up so slowly, part of the reason is that your employer keeps paying more for you health insurance. My point here isn't that a substantial share of US health care spending is wasteful or even harmful, although that does seem to be true. It's jjust that output doing to health care has a tradeoff of less output available for other uses--even when some of those other uses might do more to improve health. "Remarkably, 86 percent of health care spending is for patients with one or more chronic conditions—conditions expected to last three months ... Among the chronic population, people with more than one condition account for 71 percent of total spending. The cost of chronic diseases goes far beyond the direct amounts spent on these diseases. In the United States, seven out of every 10 deaths are caused by chronic diseases each year. There are indirect costs through lost productivity and an unmeasurable loss in the quality of life and the loss of ability to perform activities of daily living, such as bathing and eating. For adults, the most prevalent conditions are uncontrolled hypertension (uncontrolled blood pressure) and hyperlipidemia (high cholesterol and high triglycerides). For children, the most common conditions are allergies and asthma." One way of thinking about chronic conditions is that if they are managed properly (medicine, diet, exercise. whatever is needed), then health care costs are usually low. But if such conditions are not not managed properly, very expensive episodes of hospitalization become likely. In a 2011 Consumer Reports survey, one of the leading complaints among primary physicians is that patients do not take the doctor’s advice or follow treatment. For example, although 3.8 billion prescriptions are written every year, more than 50 percent of them are not taken or are taken incorrectly. The cost of noncompliance has been estimated at $290 billion. Also, 125,000 deaths each year are attributed to poor medication compliance. Interestingly, the report doesn't make an argument that Americans overall live less healthy lifestyles than those in other high-income countries. Yes, obesity is bigger problem in the US. 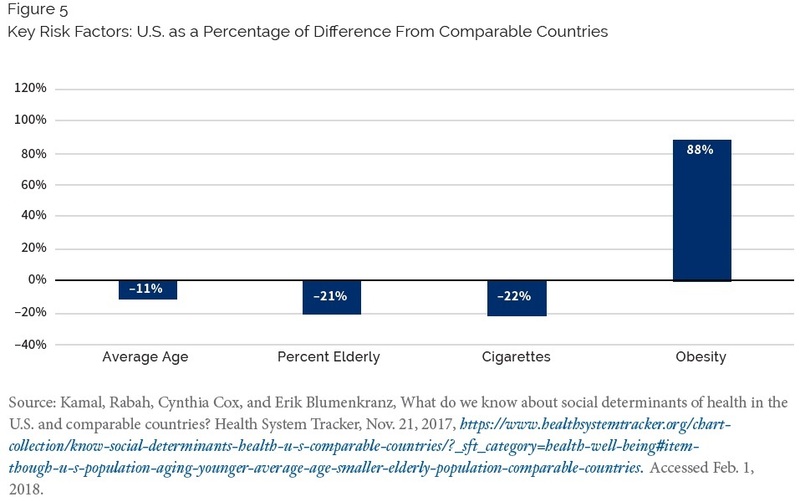 But compared to other high-income countries, the US has a smaller share of smokers and a lower share of elderly. Thus, taken as a whole, it's not clear that US lifestyles and demographic factors are less favorable than other high-income countries. "In its simplest form, the total cost of health care has two components: the direct cost of care and the indirect expenses needed to develop systems and administer the program. According to national health expenditures reports, indirect expenses have been around 15 percent of total spending for more than 25 years. Currently, 8 percent of the total is associated with costs related to administering a program, such as billing and claims payments. The remaining costs are associated with other indirect services, such as research, public health and infrastructure." Let's say for the sake of argument that we could agree on steps that would have the effect of cutting these indirect expenses from the 15% level of the last 25 years by half, with no effect on the quality of care actually received. Sounds good to me! If we can do it, it certainly seems worth doing. But with health care spending rising at about 4% per year, these cost reduction savings would be cancelled out in about two years--at which point we would face exactly the same health care cost problem that we do now. This is of course not an argument against finding ways to cut health care administrative costs. But it suggests that such changes are only a short-term palliative for the long-term of health care costs. It's certainly not going to get the US from spending 18% of GDP on healthc are to 11%. The US pays more for health care compared with other countries not because the US is sicker, but because the US pays higher prices for health care services. The report notes: "For example, a 2018 Journal of the American Medical Association (JAMA) study concluded that the major drivers of the increase in health care costs were due to the `prices of labor and goods, including pharmaceuticals, and administrative costs.' They also noted that utilization rates in the United States were similar to those in other countries." The US did not differ substantially from the other countries in physician workforce (2.6 physicians per 1000; 43% primary care physicians), or nursing workforce (11.1 nurses per 1000). The US had comparable numbers of hospital beds (2.8 per 1000) but higher utilization of magnetic resonance imaging (118 per 1000) and computed tomography (245 per 1000) vs other countries. The US had similar rates of utilization (US discharges per 100 000 were 192 for acute myocardial infarction, 365 for pneumonia, 230 for chronic obstructive pulmonary disease; procedures per 100 000 were 204 for hip replacement, 226 for knee replacement, and 79 for coronary artery bypass graft surgery). Administrative costs of care (activities relating to planning, regulating, and managing health systems and services) accounted for 8% in the US vs a range of 1% to 3% in the other countries. For pharmaceutical costs, spending per capita was $1443 in the US vs a range of $466 to $939 in other countries. Salaries of physicians and nurses were higher in the US; for example, generalist physicians salaries were $218 173 in the US compared with a range of $86 607 to $154 126 in the other countries. This report from Kaiser Society of Actuaries and Kaiser Foundation the is about setting the stage for further discussion, not about concrete recommendations. While such discussions are certainly needed, I confess that the hints about possible solutions don't fill me with great hope. There's talk about how future health care technologies might be cheaper and money-saving, rather than expensive and expenditure-increasing. Maybe! There's talk about how certain kinds of budgeting and incentives might focus more on improving health outcomes, and thus reduce the need for care. Sounds good! But I feel as if I've been hearing similar arguments for several decades, about how managed care would alter incentives of health care providers, and new technologies might help drive down costs. Across the high-income countries, there does seem to have been slower growth in the rate of health care spending starting back around 2005. But with all of that said, the fact remains that the US is spending 18% of GDP on health care. As health care economists like to note, every dollar of US health care spending is income to someone. Any steps that reduce the income received by someone will lead to protests. In a broad social sense, reducing health care spending from 18% to 11% of GDP would involve a very large shift of (mostly) well-paid workers to other jobs, with industries that provide supplies for health care receiving less revenue, and facilities devoted to health care being shifted to other uses. The build-up of US health care spending to 18% of GDP has taken decades, and a substantial reduction from that level will involve disruptive and controversial changes.